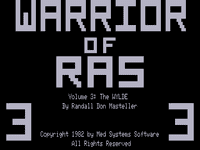 Welcome to RAS, a world entered only through Screenplay's new adventure series, the Warriors of RAS. This superb collection of graphic role-playing games promises to bring hours of fun to exercise your wit and reasoning skills. Each game is made up of randomly designed mazes, monsters and confrontations. Even beginning role-players can create strong warriors--and save them to play game after game! The call of the wild has never been more treacherous than in the Wylde, the third in the Warriors of RAS role-playing games. The Wizard sends you to find the Ultimate Treasure, but you don't need his magic to tell you you're in trouble. You'll want every weapon you can lug away from a Trading Post, every ounce of energy you can muster from a Stream of Life, and every detail you can ascertain from studying your map. Uncharted danger looms everywhere in the million acres covered by the Wylde. It harbors no less than 30 types of hostile creatures, and none of them like to fight fairly. An enlarged battle map allows you to see your opponents as they sneak up on you in groups. Do you fight? Do you back-track? Do you circle? As you take these risks you learn. You become hardened, more calculating. At the same time your character becomes stronger as reward for victories on the field, marsh and forests of battle. Play Wylde. Each time you play, the game is entirely different. And each time you can let your imagination run wild. TRS-80 program by Randall Don Masteller.